Unfortunately, the police were talking to people before the lawyer worth his salt. In Miranda v. Arizona the US Supreme Court said that if in custody and being questioned, a person had to be warned of a right to an attorney and a right to remain silent. You have the right to remain silent and refuse to answer questions. Do you understand? Anything you do say may be used against you in a court of law. Do you understand? You have the right to consult an attorney before speaking to the police and to have an attorney present during questioning now or in the future. Do you understand? If you cannot afford an attorney, one will be appointed for you before any questioning if you wish. Do you understand? If you decide to answer questions now without an attorney present you will still have the right to stop answering at any time until you talk to an attorney. Do you understand? Did you know that the police don't have to "read you your rights?" It isn't like on TV. Here is a PDF version of a card I give to people about this. Why the police have to "read him his rights." 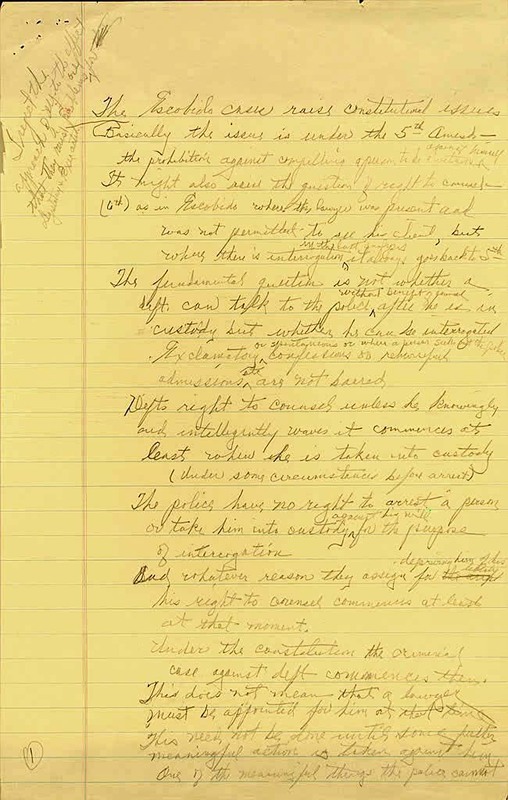 Take a look at Chief Justice Earl Warren's handwritten notes to Justice Brennan from the Miranda case. 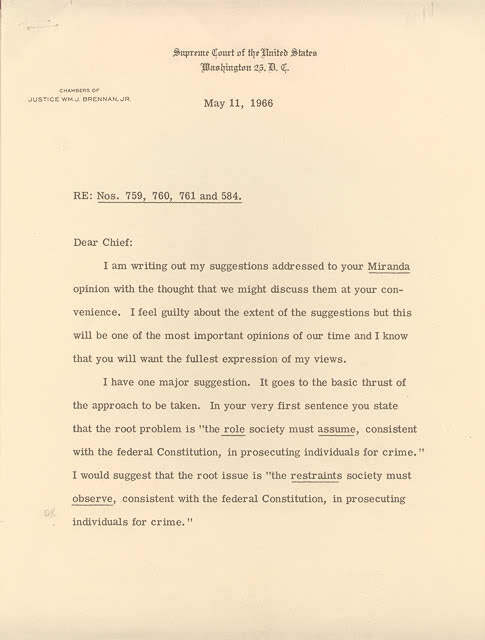 See Justice Brennan's response, too, if you like. If you wish to remain silent it is not enough to remain silent! You must say you want to exercise your right to remain silent! Magic Phrases if you are Stopped by the Police. Miranda v. Arizona - The court's full decision. Why people continue to talk even after they are read their Miranda rights. Advice on talking to the police from Madison, Wisconsin, criminal defense lawyer. And if that isn't enough, here's a whole book: But they Didn't Read Me My Rights! Copyright ©1997-2017 Charles Kyle Kenyon, Madison, Wisconsin, all rights reserved. This is a living hypertext document. If you find any errors, of fact or in links, please contact me so that they may be corrected. Please also write to me for permission to copy. You can reach me by email: Lawyer at Addbalance.